On the road in your motorhome this winter? When you’ve spent thousands on your dream motorhome the last thing you want to have to do is leave it standing on your driveway for weeks on end during winter. 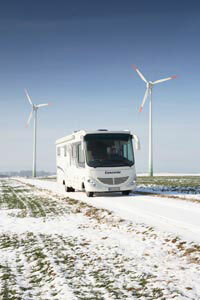 That’s why hordes of motorhomers spend the colder months out and about in their motorhomes still enjoying their hobby. Many seek out the winter sunshine of places like Spain or Portugal or the ski slopes of Austria or France but others like to stay closer to home. It divides opinion but some say that winter motorhoming is better than spending a summer in their ‘van. This is because there aren’t the guaranteed holds-ups of the summer months like the long queues as people head for our most popular destinations. Bright and crisp mornings are perfect for walking and it’s unlikely that campsites (that are open all-year round) will be full. So, whether you want to see in the New Year on a campsite in Scotland where there may be some package available for site, dinner and a New Year’s Eve party available, visit a Christmas market in Belgium or grab some winter sunshine in Portugal, your motorhome is still the perfect travelling companion. It’s important that any motorhome novices make sure their vehicle is fit for purpose before embarking on a winter trip. For example, fresh and waste water in externally mounted water tanks could freeze in sub-zero temperatures. Many water tanks are fitted under the floor and purpose-designed immersion heaters are available from motorhome accessory stockists or you could lag them with some sort of insulation to help prevent them from freezing. Keeping the ‘van warm will help too but it’s worth asking your dealer for their advice before you set off on your winter adventure. Other tips include using external blinds to reduce condensation, carrying plenty of anti-freeze and checking the local laws of any country you visit as you may be required to carry snow chains and high visibility jackets for example. In case you have to park on wet and snow-covered grass, take a grip mat with you to solve any traction problems and use Propane gas and not Butane. To get the most out of winter, take your waterproofs and walking boots too – perfect companions for those chilly days. And don’t forget to drain your motorhome down when you return home. One of the great things about touring in the UK is that interesting landscapes are not very far away at any time. Where we live the countryside is flat but the Peak District is quite close. In winter time the wonderful snowy slopes of Derbyshire offer a massive contrast to our locality giving us wonderful winter breaks not too far from home. 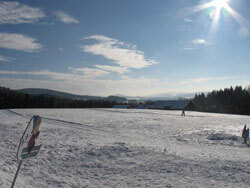 With excellent camp sites and pubs with raging open fires, Derbyshire in winter has a lot to offer. With modern insulation and heating, there is no reason why anyone in motorhome or caravan should not enjoy it all winter. Sensible precautions – use hard standings and electric hookups are a must – you can have the heatin (on electric) on low level all night and also when you are out so that the van is warm to come back to. Soups are great in this weather and slow cookers are useful to have a meal ready-cooked when you get in. We have camped in Dumfries in snow and even climbed Criffel when all the waterfalls were frozen solid – a totally different scenery!